SCVHistory.com | General Interest | The Newhall Incident: Tragedy and Heroism. The Newhall Incident: Tragedy and Heroism. They called it the "Newhall Incident." It was the worst massacre of peace officers in the 80-year history of the California Highway Patrol. It changed police procedures forever after, leading to improved police training on how to approach a suspect, better weaponry, bullet-proof vests  saving the lives of many police officers in the line of duty. It was the story of the bravery and sacrifice of four young CHP officers, and it was also the story of a true American hero: a civilian bystander who risked his life under fire from gun-toting suspects in an effort to save the life of a downed patrolman. 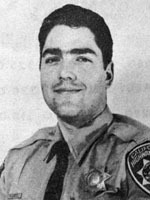 On the evening of April 5, 1970, four CHP officers  Roger Gore, Walt Frago, James "Skip" Pence and George Alleyn  were murdered in the parking lot of a Standard service station next to J's Coffee Shop at the present-day intersection of The Old Road and Magic Mountain Parkway in Valencia. The two suspects, Jack Twinning and Bobby Augusta Davis, were down-and-out career ex-convicts. They met and became friends in prison. One had been released 11 months earlier from the federal penitentiary in Tallahassee, Fla. Now 34, he had been in and out of eight federal prisons for various offenses since he was 16. The other had been released from prison eight months earlier and was serving his parole time in Houston. Both had tried and failed to land legitimate jobs after leaving prison. They met again in Houston and rode out to California to turn back to the "dark side" and score a big hit. After staying for a while in Sacramento and failing to pull off an intended bank robbery, they rode down to Los Angeles in a red Pontiac. As they drove south on Highway 99 between Gorman and Newhall, they noticed lots of construction along the highway and figured they could come back to steal explosives from the construction sites to use in a future robbery. In the car with them was a veritable armory of guns. After renting an apartment in Long Beach, the suspects encountered an armored truck delivering cash to the Santa Anita racetrack. They followed the truck on its usual route and decided on a plan to rob it on a freeway ramp. But to accomplish their diabolical plan, they needed explosives. Late in the evening of April 5, 1970, they drove to a construction site between Newhall and Gorman on the northbound Golden State Freeway with the intent of procuring the explosives. Twinning left the car to search for explosives. Davis stayed in the car and parked on the side of the road behind a family stranded with an overheating radiator. With the family eying him suspiciously, Davis got nervous and made a quick U-turn onto the southbound side of the highway. Ivory Jack Tidwell and his wife, Pamela, were traveling southbound on Highway 99 when they were almost sideswiped by Davis in the Pontiac as he made his U-turn. They took down the license plate number of the car. Tidwell was angry and pulled alongside the Pontiac to tell the driver off. But Davis reacted by pointing a two-inch revolver at the Tidwells. Jack Tidwell sped away and pulled off the highway further down the road to call the police and report the violent encounter. 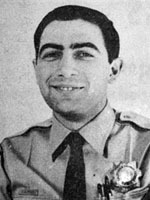 The four young officers were relatively new to the CHP, having graduated from the police academy less than two years earlier. Partners Roger Gore and Walt Frago spotted the Pontiac, now occupied by both suspects, as it headed south through the Newhall area. They followed the Pontiac as it left the highway and pulled onto Henry Mayo Drive (now Magic Mountain Parkway). James Spence and George Alleyn, driving in their patrol car northbound at Lyons Avenue, picked up the radio call from Gore and Frago and prepared to back them up. The suspects turned north onto what is now The Old Road and pulled into the driveway of the Standard station next to J's Coffee Shop at the current location of Marie Callender's restaurant. The CHP officers flashed the red lights of their patrol vehicle as Gore got out to apprehend the suspects. While Gore patted down Davis, Frago covered him with a shotgun. Suddenly Twinning got out of the Pontiac and fatally shot Frago. The horror had begun. Distracted by the gunfire from Twinning, Gore could not react in time as Davis shot him. "Newhall, 78-12! 11-99! Shots fired. J's Restaurant parking lot." Pence sent this desperate dispatch message as he and Alleyn pulled into the gas station driveway and saw their two comrades lying on the pavement. A gun battle ensued between the suspects, who crouched behind their Pontiac, and the two officers. Despite their best efforts, both Pence and Alleyn were shot and killed. Throughout history we find stories of tragedy accompanied by great heroism. The Newhall Incident was no exception. Gary Dean Kness was driving past J's Coffee shop on his way to work when he saw the gun battle unfolding at the Standard station. 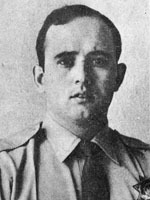 As he saw one of the wounded officers fall to the ground, Kness raced out of his car to the officer's side and tried to pull him out of the line of fire. While helping the officer, Kness saw one of the suspects approach him with a sawed-off shotgun. Having served in the U.S. Marine Corps, Kness instinctively picked up the officer's shotgun and attempted to fire, but the gun was empty. He then picked up a revolver and managed to fire off a round. Hit, the suspect ran off with a gunshot wound. 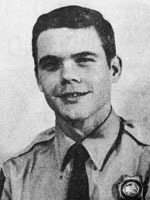 On June 5, 1970, at a Memorial Wall dedication at the Highway Patrol office on the Old Road, Kness was honored by the CHP for his heroic efforts to save the officer. He was honored as a hero again at a ceremony in April 2008 when a portion of Interstate 5 was named for the four downed officers. On April 5, 2009, Kness received a heartfelt and emotional standing ovation from a crowd of more than 200 people, including many police officers and others involved in the Newhall Incident, when he told his story at a Santa Clarita Valley Historical Society event held at Hart Hall in William S. Hart Park to commemorate the 39th anniversary of the tragedy. Never before had so many officers been killed in a single incident. After the shooting, the two suspects took off in opposite directions on foot. Davis headed up San Francisquito Canyon Road where he was apprehended by police officers. He was eventually convicted and sentenced to death. His sentence was commuted to life in prison when the California Supreme Court overturned the death penalty. Davis committed suicide Aug. 16, 2009, in his maximum security prison cell at Kern Valley State Prison. Twinning ended up barricaded in the home of Steven and Betty Jean Hoag on Pico Canyon Road near The Old Road, where he shot himself to death when the house was surrounded by police. He had previously sworn never to return to prison. The Newhall Incident left in its wake four young widows and nine fatherless children. Sympathy poured in from a stunned community as more than 5,000 letters were sent to CHP headquarters with nearly $100,000 in donations for the families. Gore, Frago, Pence, and Alleyn did not die in vain. As a result of their sacrifice, police procedures were re-examined and changed, making the jobs of police officers across the country much safer. We'll never know how many more police officers' lives may have been lost in the interim, if not for the tragic loss of life and the changes that resulted from the worst day in the history of the California Highway Patrol.